Is patient care starting to feel a little repetitive? We get it. Patient care isn't for everyone. Is it time to leave and get outside of patient care? Maybe you are burned out, bored, or simply ready to try something new. You are in the right place. 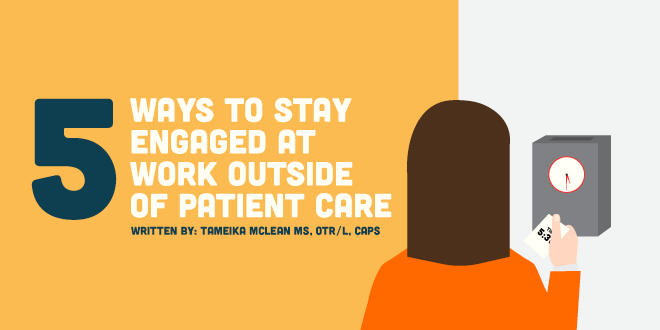 Check out one (or more) of the following ways to stay engaged at work outside of patient care. If your organization isn’t large enough to have committees, find the knowledge gaps at your company and fill them. For example, if there are not enough cognitive screens or ADL assessments at your organization, create a folder with some relevant ones and place it in a central location. If the wheelchair or seating/mobility orders could be better organized and tracked, take ownership and use a binder with tabs for each month or patients’ names to re-organize them. If your clients need more information about home modifications or places to rent or purchase ADL equipment in your area, find or create handouts for them. The National Board for Certification in Occupational Therapy (NBCOT) and the American Occupational Therapy Association (AOTA) are the major national organizations with volunteer opportunities specifically for occupational therapists. However, other local and national organizations also recognize the great work we do and our unique perspective. Find one you’re curious or passionate about. Meetup.com is a great way to learn about other industries, network inside and outside of healthcare, and meet new people in general. Find one geared towards your interests and take the chance. You might learn about opportunities you couldn’t have imagined! They’re a wonderful way to demonstrate continued learning. Note that each certification has specific requirements for education and eligibility, as well as an exam and initial certification fees. Each one also has its own education requirements and renewal fees. Examples of common OT certifications include Certified Brain Injury Specialist (CBIS), Assistive Technology Specialist (ATP), Seating and Mobility Specialist (SMS), Certified Low Vision Specialist (CLVT), Certified Aging-in-Place Specialist (CAPS), and Certified Lymphedema Specialist (CLT), just to name a few.